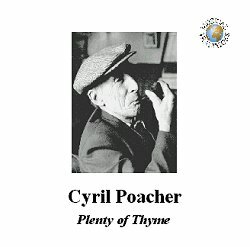 This collection of songs from the Suffolk singer Cyril Poacher is Musical Tradition's second CD release and this is a review of it for the magazine Musical Traditions. So gently does it, Quinn, and watch yourself. Most of you will be aware that the booklet notes that accompany this CD are reprinted elsewhere in these pages as is the complete track listing. So I can't bore you with any of that stuff; I'll just have to bore you with how good it all is. The copious booklet notes begin on a note of regret that 'the picture of Cyril which emerges is rather less clear and vibrant than that of Bob' - Bob Hart, that is, the subject of the first MT CD. I don't know - the booklet tells me he was a hard working chap, a good father, evidently well-liked in his community, generous with his time (Ginette Dunn seems to have spent a long time with him), had a playful sense of humour, a large repertoire of songs and was 'a cantankerous old bugger'. Sounds like a Suffolk traditional singer to me. The main part of this CD is taken up by a selection from what Rod Stradling (editor of this magazine and the virtual one man industry that has made this CD possible) calls "the Dunn hoard" - three full 5" reels and several tracks on others of the songs and comments of Cyril Poacher recorded by Ginette Dunn in pursuance of her 1977 Leeds University PhD thesis 'Popular Singing Traditions in and around Snape and Blaxhall' rescued from their incarceration in said university. What happened to the comments of Cyril Poacher, by the way? Other recordings come from the collections of Tony Engle, Keith Summers, Neil Lanham and Mike Yates. The tracks on offer have obviously been chosen with great care, not only for quality of recording and singing, but to give an impression of the breadth of the singer's repertoire. There are English, Irish, American and Music Hall songs here (and one or two rarities in the latter category - Running Up and Down Our Stairs anyone? [sound clip]), all of them learned by Cyril orally, from members of his family, from travellers, from a policeman (!) and from other noted local singers such as Bob Scarce and Wicketts Richardson. Serious songs, sentimental songs, funny songs, chorus songs - all grist to the mill for the pub singer and all ready to be pulled out of the hat when the occasion demands. I should think Cyril a canny chap and well able to gauge the mood at any particular part of an evening's singing and come up with the appropriate song. The impression gained on listening to the songs here is that of a very 'strict' singer, who would rarely deviate from his usual way with a song. Indeed, the performance here of The Nutting Girl (recorded by Tony Engle in the singer's home) is exactly that described by Ginette Dunn at length in the booklet notes after a performance of the song in the Blaxhall Ship. Sure, the tone of a performance may change given a receptive pub audience (the last track here is a wonderful performance by Cyril of Nancy of Yarmouth recorded during a pub evening), but the elements of the song and performance remain the same. He even, while being recorded in his own home for the benefit of Tony Engle and a microphone, repeats the last chorus of The Nutting Girl as if he were in the pub (sound clip). Dunn says: 'He is serious about his singing and how people regard it, since for him the singing role is endowed with value and he takes the spotlight with gravity'. I should imagine he was just as serious about his singing into the microphone as he was in the pub. Keith Summers: 'There was nothing flippant, nothing playful about his singing … this was his legacy and he knew it'. I think what Dunn and Summers say here is very important - Cyril and his generation took their singing very seriously indeed and anyone who thinks these are just old codgers singing in the pub and in their cups should think again. These people made choices, intelligent choices, both in their songs and in the way they sang them. They took their audience seriously as well and when the audience began to change in the '60s and people didn't want to hear such songs in the pub and there was not proper order for the singer, then the likes of Cyril became disillusioned and he stopped singing regularly. Just listen here to the 1975 Blaxhall Ship recording of The Great Big Wheel and note the amount of background chatter going on (sound clip). Dunn's description of the performance of The Nutting Girl, so detailed as to probably enable total recall for anyone who was there, is a perfect picture of a man absolutely in control of his interpretation and of his audience. Total manipulation. Alfred Hitchcock would have been proud of it. A man who took his role seriously, then. He sang 'in the classic declamatory Blaxhall style that drew out all the drama of these great old songs' (Keith Summers). And here, in the very last track, we have a perfect example of just that. Nancy of Yarmouth recorded in the Swan at Worlingworth by Mr Summers himself, and what a magnificent performance it is, sung as if his life depended upon it (sound clip). I can sound my own note of regret here that this is one of only three tracks recorded in performance with an audience, when a singer will generally put on the best show. I have already said that I don't think there was much difference between Cyril in the pub and Cyril down on the farm, but the three tracks here (and Nancy of Yarmouth in particular) show that added slight vital spark that comes with a pint and an audience. This is not to diminish the rest of the performances. Cyril is, on first listening, a difficult singer. Unlike Bob Hart, who had, to these ears, a very relaxed, attractive and easy going approach to a song, Cyril could sound very dour on occasions. I doubt whether he made any concessions to how any song was originally. Words were changed, lengths of lines altered, tunes played around with. This all may have happened gradually and unconsciously over the years as inevitably happens; I suspect, in Cyril's case, that it was mostly quite deliberate. Dunn's account of his singing of The Nutting Girl provides good examples of this and implies its premeditation. Difficult though it may be at first hearing, you soon warm to this declamatory style and little tricks, honed to perfection over the years. Favourite gambits are to lull you with a few lines sung quietly and then swoop down on you when you're not expecting it, and to cut short certain words and sometimes whole lines for dramatic effect. Mr Stradling has chosen his tracks well and I would particularly single out for mention as classic Poacher deliveries The Bonny Bunch of Roses (sound clip), Running Up and Down Our Stairs, Australia, and the three live tracks - The Great Big Wheel, Lamplighting Time in the Valley and Nancy of Yarmouth. The booklet tells you all you need to know about the songs and provides valuable little pictures of Cyril and his environment. I have noticed, however, a tendency in the magazine itself, which has now spilled over into the CD notes, for the editor to be over-familiar about his own surroundings and assume such familiarity in his readers. The second sentence of the booklet notes: 'When Danny and I were visiting East Suffolk …' ; now I know who Danny is and some of you may as well, but the casual reader won't - his son, brother, gay lover? We need to be told that she's his wife, actually. References such as these and to the private life of his co-editor which occasionally appear in the magazine's pages are out of place, I feel. A small quibble it is and I hope it stays that way. Back to the booklet - there is a lovely, if brief, reminiscence from one of Cyril's daughters, a resume of the politics of traditional singing in Suffolk and an amusing set of memories from Keith Summers, containing a couple of anecdotes typical of both participants - and I now feel myself falling into the same trap! Mr Stradling relates that he was largely unimpressed with Cyril's singing when he heard him sing in the late '60s and that it was the tracks on The Voice of the People that were largely responsible for changing his mind. They certainly opened my ears. Cyril had stopped singing regularly when I started to visit the Blaxhall Ship and I don't remember ever having heard or seen him. But I have spent several happy evenings and lunchtimes in the company of Geoff Ling, Percy Ling, Kensa Diaper and others of that generation and I wish I had heard Cyril as well. This excellent CD will have to do.